David was 30 years old when he began to reign. He reigned in Hebron for 7 years and he reigned in Jerusalem for 33 years. In all, David’s reign lasted 40 years. I came to Iloilo when I was 24 years old. I have pastored this church for 33 years. I need another 7 years to complete the 40 years as a Pastor. And it has been Pastor Lily’s and my intention to pastor for 40 years. In the Hebrew bible, 40 is often used as a time period which separate 2 epochs; a particular period marked by distinctive features, events etc. The reign of Saul was definitely different from that of David. The next Pastor of this church will definitely have his or her own distinctive features and characteristics. Several Kings are said to have ruled for 40 years, which in itself is considered a generation. The first 3 kings of Israel; Saul, David and Solomon each ruled for 40 years. All three were specifically chosen by God. So, I should say that it has been God’s intention for them to rule for 40 years; their generation. I think if you want to be a leader, you should lead for 40 years. Also, it is God’s intention for he or she to rule in his or her generation. In this portion of scripture, we can learn from God himself concerning his ideal qualifications for a leader. Verse 3 records David’s third anointing. He was first anointed by the prophet Samuel. Then he was anointed as king over the house of Judah in Hebron and finally he was anointed as the rightful king by the entire nation. Last week, we install and dedicate the various leaders; LAT leaders, leaders of head of department, cell leaders, pastors, peer leaders, mentors etc. I remember I prayed for God’s anointing over you in carrying out your responsibilities as a leader of this church. So, you not only should serve for 40 years and rule for your generation but also you must be anointed. God will anoint you at various stages of your life. 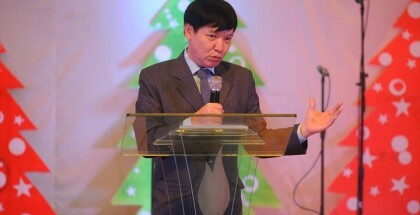 I also want to address all of you who came up last Sunday to be prayed and dedicated. I treat you as leaders of this church and this message is for you. What are the qualities that God must find in us to be a leader? There are three reasons given here why you can be considered a leader. Firstly, David was their relative. The people say to David, ‘we are thy bone and thy flesh.’ The expression ‘your bone and flesh’ is found in a number of places in the Old Testament. It is a way of expressing close kinship based on physical relationship. The English idiom speaks of ‘flesh and blood’ as ‘we are your people, we are the same people, we have the same blood, we have the same ancestor. They pointed out that they were his kinsmen, his own flesh and blood, that is, all were descendants of Jacob. The first reason you can be considered a leader is there is a blood relation, inasmuch as all of us are bought by the blood of Jesus Christ. Are you a child of God through the blood relations with Jesus Christ? Last Sunday we sang the song ‘No longer slaves’ but the anointing of the song was on this phrase, ‘I am a child of God.’ You recognize, you feel and you know that you are a child of God. You are not an ordinary person. Do you have this distinctive impression inside your spirit? You are related to the children of God by the blood relationship with Christ. I was listening to my cell members and they were saying that even Catholic feel that they have received Christ as their personal savior. It is not a big thing to receive Christ as their personal savior and still be a Catholic. So, it is not just a matter of being a Christian but one who knows that he or she is a child of God. You have to be part of the family of God if you can even be considered a leader. David possesses the first and indispensable quality of being a leader. He is an Israelites. Are you a child of God? Secondly, he was a successful military leader under Saul. His military talent has furnished ample proof. He has distinguished himself as a hero. I must be successful in whatever I do to show that God is with me. 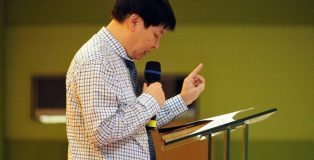 In the first 7 years of my Christian life in Singapore, YHWH was with me. I was active, and promoted from being a committee member of the Youth Church to become the Vice-President and finally the President of the Youth Church. At the same time, together with Pastor Lily we two became the main coordinators of the Evangel Explosion program in our ex church before we came over to Philippines. The EE group has grown from just 20 people to 200 people in the span of 7 years. When God put me as a JECPP leader, I became the chairman and under my leadership our region grew from just 3 outstation churches in 1994 to 341 churches before we were separated from the organization. Are you successful as a leader? Have you shown ample proof in being successful whatever you do for the LORD? Have your cell group grown under your leadership. Have your department grown or improve as a result of your leadership. David defeated the Philistines. Unlike Saul, David only goes to battle if God gives him the command. Like Jesus, he only does what God tells him to do. I believe that is the secret of David’s success. The great things that follow David’s recognition as King remind us that success can come only when our will is in harmony with the known will of God. All the tribes of Israel recognized that ‘in time past, when Saul was king over us, thou wast the leader of Israel (thou leddest out and broughtest in Israel). Note the phrase, ‘thou leddest our and broughtest in Israel.’ It means that David did superintend (supervise, manage, overseers, control) the affairs of all Israel even under Saul. When you were under a leader of this church as David was once under Saul, were you already recognized as one who leads a group of people. ‘Led out and brought in’ means going out and coming in. It is a reference to battle. When David goes in and goes out, the LORD was always with him. It was David who led Saul’s forces to victory. This indicates leadership and direction in times of combat. Do you have leadership and vision in whatever you are doing for God? Or you have no direction and simply just follows instructions. How about you right now as a leader chosen by the church in whatever capacity. Are you like David where you went on and grew great and the LORD of hosts is with you? Is your success due to YHWH’s presence and plan? Can you perceive that the LORD has established you and exalted you for the congregation’s sake? We just had our Medical Mission with the 20 members team from Ministry of Health Singapore. Firstly, I want to thank all who came to support the medical team, acting as translator, helping in the registration and provide the much-needed support to the Medical Mission. Without your assistance, we will really be handicapped. When I was in Rizal Estanzuela, Tanza, Pastor Carlyn introduced me to a tanod who wants to tell me something important. 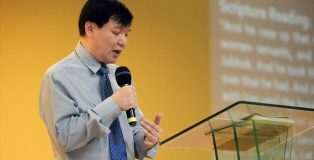 He remembered almost 30 years ago, Pastor Lily channeled almost 40,000 pesos (at the time, it was a lot of money) to help a 5-year-old boy, who had a blotted stomach, had some sort of brain damage similar to meningitis. He was given up for dead. We sent him to the hospital but the chances of him living was so slim. At that time, Pastor Lily and I really had a big tussle with our congregation. There was a lady who wanted Pastor Lily to donate her blood to help a relative of her but she herself wouldn’t want to donate her own blood. 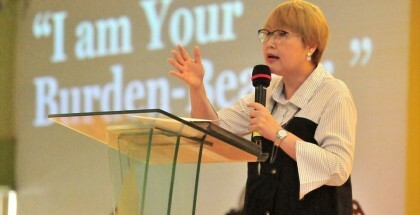 Then there was another lady who gave Pastor Lily so much problem that she was disillusioned with helping the Filipinos. I am just trying to be honest. So instead of helping these two recalcitrant members, she decided to pour her resources on this 5-year-old blotted stomach boy with brain damage. Pastor remembered that incident but I forgot totally about it. At the medical mission, the tanod pointed me to a 31-year-old boy that has grown up, with no blotted stomach. He survived and is living today. We were so encouraged that whatever we do, we will succeed and will have results. God knows your heart and will aid you. Is your success due to YHWH’s presence and plan? Can you perceive that the LORD has established you and exalted you for the congregation’s sake? Thirdly David was the LORD’s choice. 2 Samuel 5:2 says, ‘the LORD said to thee, “thou shalt feed my people Israel, and thou shalt be a captain over Israel.’ ‘Thou shalt feed my people Israel’ in the NASB is translated as ‘You will shepherd My people Israel.’ This is a powerful imagery of a leader of God; exercising his presence, care and provision over God’s people; all qualities of God himself. Moses acted like a shepherd. David was a shepherd when Samuel called and anointed him. YHWH is characterized as a shepherd himself. The Messiah is described in this imagery. Are you a shepherd to your congregation? Do you care, provide and was always there for your people? Are you a captain? I remember specifically God told me in no uncertain term that I shall be a commander, a captain and people will come from the North, South, East, West. YHWH had called him to be a shepherd and prince over Israel. The people’s desire for him to be King was further increased by their knowledge of the will and purpose of God, as declared by Samuel. Not only they have the knowledge of the will and purpose of God concerning David, they also were conscious of the calling and anointing of the LORD in bringing David to power, to shepherd them. Let me ask you a question? Are you the LORD’s choice? Or are no more God’s choice, as Saul was no more God’s choice. Immediately when David being the chosen leader of the whole of Israel, the enemy spread themselves over his territories. When the anointing has taken place and the Kingdom business is at hand, the enemy invariably shows up. The Philistines were a tribe allied to the Phoenicians. They were a branch of the primitive race which spread over the whole district of the Lebanon and the valley of the Jordan, and Crete and other Mediterranean islands. Some suppose them to have been a branch of the Rephaim. The Philistines, being from the Aegean Islands with Greek culture were the only people of the region not circumcised. When you say you are not circumcised, it means you have no faith in God. This powerful tribe made frequent incursions against the Hebrews. There was almost perpetual war between them. They sometimes held the Israelites in degrading servitude, at other times they were defeated with great slaughter. These hostilities did not cease till the time of Hezekiah when they were entirely subdued. They still however occupied their territory, and always showed their old hatred to Israel. Suffice to say, they were the constant enemy of Israel throughout history. Later they assimilated into the culture of the nation where they dwelled in. Today the Palestinian trace their origin to the Philistines. Until today they are still the enemy of God’s people. Today the Palestinians lived in the Gaza strip, West Bank and East Jerusalem, all territories belonging to Israel. They have the habit of just stealing what rightfully belongs to Israel. As a leader of God’s people there will always be enemies. Many times, the enemies are within like the Philistines who has assimilated into the culture of the church. But I am going to make a strong statement. Another sign of YHWH’s presence with the church or with the leader will be the defeat of our enemies. There will always be enemies in my life. But a sign of YHWH’s presence being with me will be the defeat of my enemies. Let’s study a little bit concerning our enemies. The bible says they were spread over the valley of Rephaim. The valley of Rephaim is the valley of giants. Rephaim is another name for giants. We learn from the book of Enoch that giants were the offspring of the fallen angels and human women. When God destroyed the world with a flood during Noah’s time, these giants whose father is a spirit and mother is flesh were not cast into hell and definitely were not allowed to go to heaven. Thus, they become disembodied spirit on earth without a body. Actually, they are the evil sprits or demons. That is why evil sprit or demons are strong like giants. Our enemies will always be the evil sprits and demons. So, if you don’t subdue them, they will put you in degrading servitude, steal what rightfully belongs to you and occupied your domain. There will always be giants in our lives when we become leaders. But a sign of God’s presence in my life will be the defeat of giants in my life. So, to know whether God’s presence is in my life will be the defeat of evil sprit and demons. This is something that is very important. Saul was always never able to defeat the Philistines. But David’s specialty is the defeat of the Philistines. Those of you, who are in bondages and afflictions, one of the signs that God is with you is the defeat of evil spirits and demons and bondages and victory over afflictions. 2 Samuel 5:22-25 says, ‘And the Philistines came up yet again, and spread themselves in the valley of Rephaim. And when David enquired of the LORD, he said, Thou shalt not go up; but fetch a compass behind them, and come upon them over against the mulberry trees. And let it be, when thou hearest the sound of a going in the tops of the mulberry trees, that then thou shalt bestir thyself: for then shall the LORD go out before thee, to smite the host of the Philistines. And David did so, as the LORD had commanded him; and smote the Philistines from Geba until thou come to Gazer. Notice that the phrase ‘And the Philistines came up yet again, and spread themselves in the valley of Rephaim. Look at the tenacity of the Philistines against us. But David constantly inquired of the LORD. Notice that David did not assume that God’s guidance for one battle would be the same for the next. God’s strategy in the first battle was direct assault, in the second, ambush. David was never presumptuous. The problem with Saul was he was always presumptuous. He always assumes that it is alright to do certain thing. That problem comes about because Saul has never inquired of God. Notice the second incident; when David hears the sounds of the Mulberry trees then he shall attack. I believe that God allowed me to experience something similar to David. I cannot forget that experience until today which I believe it is something that God is trying to speak to me. I was in this beautiful resort up the mountain just below the foot of Mount Apo in Davao. One morning I was very troubled and disturbed because I was accused and shamed by my leader the day before. I needed to touch God to survive that onslaught. It was a morning, and it was very quiet but the place was filled with tall trees. Then suddenly a wind blew and I can literally hear the whizzing sound of the leaves from all the trees when they rub against one another because of the wind. The sound was loud and beautiful to hear and distinct in its unique sound. When David inquired of the LORD, he was told to watch for the sound of the Mulberry trees. It says here in 2 Samuel 5:24, “And let it be, when thou hearest the sound of a going in the tops of the mulberry trees, that then thou shalt bestir thyself: for then shall the Lord go out before thee, to smite the host of the Philistines.” The Mulberry trees rustled by the movement of the air produced the sound. It is a representation of the Holy Spirit. When the Spirit of the LORD comes it comes like a sound from above. The sound represents the power of the Holy Spirit that is so needed in our leadership. The sound also represents the leading of the LORD. Also, the sound of the marching is not merely wind blowing, but the sound of the angelic armies of God going ahead of them in battle. It is so wonderful to be led by God because the angelic beings are at our disposal. The notable characteristic of David was he always inquire of God whenever he wants to do something, especially when it is important. There are 150 Psalms in the bible and most of them are written by David. The book of Psalms reveals the deep relationship David has with God. A person who constantly inquires of the LORD will have a deep special relationship with God. He becomes the apple of God’s eyes. That is the chief difference between he and Saul. Take note that both were chosen and anointed but Saul was rejected. The writer carefully notes that David ‘inquired of the Lord; before making the decision to attack the Philistines. Unlike Saul, he was careful to determine the Lord’s will concerning any offensive action. David’s inquiry into the divine will occurred with the assistance of an Aaronic priest. Saul on the other hand has a habit of disobeying God. Please understand that Saul was rejected not because of one incident but continual habitual disobedience to God. And this habit of disobeying started very early in his kingship. He has a habit of disobeying God’s expressed will. It means that when he was chosen, a year later he started disobeying the expressed will of God. And Saul has always made excuses for his disobedience. There is always a good reason why he did not follow the instruction of God. To put it bluntly. He was never wrong. There is always a reason why he does certain thing in certain way. The bible listed why Saul is rejected as king. 5. He was seeking direction from the witch of Endor. God is looking for a leader who is obedient to his commands. When one reads David’s life, it was not one that is sinless and without faithless acts. But it was one who follow God with a whole heart and constantly inquire from God especially during important decision. What happens to a person who constantly disobey God’s word? Saul has irrational mood swing. It is a kind of mental illness. The bible says ‘an evil spirit troubled him.’ The word trouble means terrorize. An evil spirit terrorizes him. Remember the Rephaim? When you disobey God, an evil spirit will terrorize you. I mean Saul was once a shy, caring person, chosen by God but he became a paranoid, fearful person, who always have a way of cooperating with evil. When you disobey God, you are actually cooperating with evil. Saul was always gloomy. Why? Because he had this consciousness that he had not acted up to the character of a leader that God has put him. And when he knew he was going to lose the leadership to others, it made him jealous, irritable, vindictive, subject to fits of morbid melancholy. Mental illness is not demon possession but it has a way of asserting that YHWH caused it. The bible says, an evil spirit terrorizes him. Look at the people of the world today? There is terrorism in this world. They terrorize the world. They troubled the world. Is it because they constantly disobeyed God and God has rejected them? Do you have a calm spirit today? Or Every day? Or you have a troubled spirit every day. David is so different. Because he constantly inquires of God, he has calm spirit. He has this spirit of peace that all will be well. Even when there is trouble, from the Philistines, he always defeated the philistines. He is not afraid of what lies ahead because all will be well. David trusted YHWH’s care and purpose. It is so important not to let immediate circumstances distort one’s view of God and His character. 2 Samuel 5:25 says, ‘And David did so, as the LORD had commanded him; and smote the Philistines from Geba until thou come to Gezer.’ David did as the LORD commanded him. What a summary of the difference between David and Saul. Each was a king. Each had the opportunity to be great. But where Saul disobeyed the LORD’s commands, David did as the Lord commanded. It is this that enable us to reach the full potential of the gifts and abilities God has given us. We don’t see God physically. So, more often than not, we obey God through our leaders. Of course, unless the leader instructed you to do evil, then you don’t have to obey; other than that, if you can obey your leader who you can see, you are learning to obey God who you cannot see. If you have a habit of disobeying the instructions of your leader, you in a way is actually disobeying God. David inquired of the LORD by the Urim. And when he had received an answer, he went about executing the plan. The words, Urim and Thummim signify lights and perfections. The Septuagint render them, revelations and truth. They are worn by the High Priest. In David’s lifetime as a King, he had two high priests; Abithar and Zadok and also two prophets: Gad and Nathan. David always consulted them. Because David learn to inquire of the LORD, he can do what Saul could not do. David put an end to the Philistines threat. David is a faithful soldier who trust the guidance of YHWH. David doesn’t do anything until God gives permission and David wins. What happens when a leader has a habit of inquiring from the LORD? The result was the growing power and importance of both David himself and the nation he ruled. For most of the tenth century BC, Israel was the most powerful nation in the whole region. The biblical writer acknowledges David’s skills and achievement but he credits them ultimately to the LORD God Almighty. These achievements were not intended by God to glorify David but to benefit God’s people. Without doubt, David brought many material benefits, peace and prosperity to Israel. How important it is for a leader to have a habit to inquire of the LORD.